A fire alarm system has a number of devices working together to detect and warn people through visual and audio appliances when smoke, fire, carbon monoxide or other emergencies are present. These alarms may be activated automatically from smoke detectors, and heat detectors or may also be activated via manual fire alarm activation devices such as manual call points or pull stations. Alarms can be either motorized bells or wall mountable sounders or horns. They can also be speaker strobes which sound an alarm, followed by a voice evacuation message which warns people inside the building not to use the elevators. Fire alarm sounders can be set to certain frequencies and different tones including low, medium and high, depending on the country and manufacturer of the device. Most fire alarm systems sound is like a siren with alternating frequencies. Fire alarm warning devices can also be set to different volume levels. Smaller buildings may have the alarm set to a lower volume and larger buildings may have alarms set to a higher level. 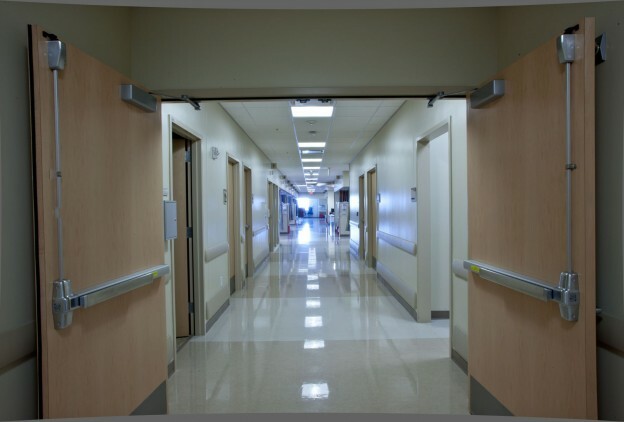 Fire doors are an important part of a building’s passive fire protection system, and doors in a means of egress provide life safety by allowing people to exit quickly when necessary. Still, the requirements remain a mystery for many architects and specifiers. 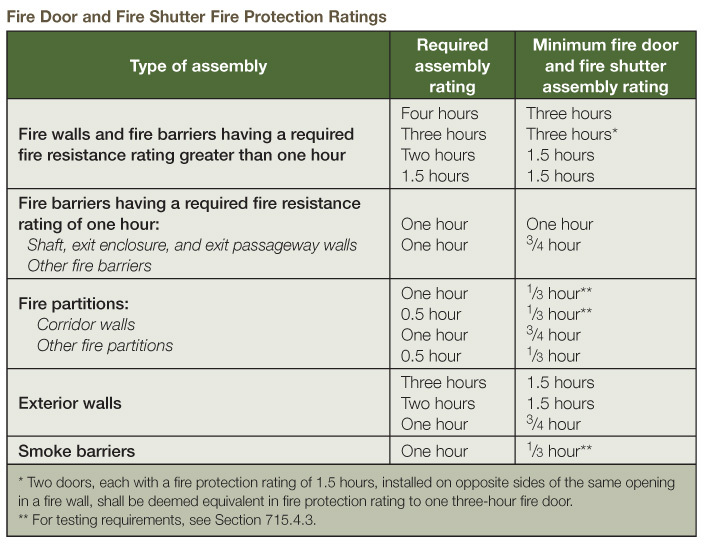 Simply put, an opening protective in a fire or smoke barrier is required to be a fire door assembly, which includes the door, frame, hardware, and glazing. These components are not typically required to be supplied by the same manufacturer—in most cases, they can be separate products which are listed, labeled, or classified for use in a fire door assembly. Occasionally, an assembly will be made of components that have been tested together and must be used to maintain the rating. National Fire Protection Association (NFPA) 80, Standard for Fire Doors and Other Opening Protective, is referenced by the International Building Code (IBC), International Fire Code (IFC), NFPA 101, Life Safety Code, and other codes and standards. NFPA 105, Standard for the Installation of Smoke Door Assemblies and Other Opening Protective, addresses smoke doors. Fire doors can help compartmentalize a building, prevent the spread of smoke and flames, and protect egress routes to allow for safe escape. However, they must be properly specified, installed, and maintained to provide the necessary protection. 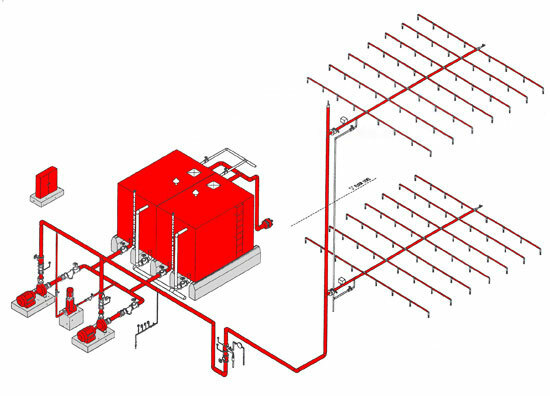 A fire sprinkler system is an active fire protection method, consisting of a water supply system, providing adequate pressure and flow rate to a water distribution piping system, onto which fire sprinklers are connected. Fire hydrant pump systems (also known as fire pumps, hydrant boosters, fire water pumps) are high pressure water pumps designed to increase the fire fighting capacity of a building by boosting the pressure in the hydrant service when mains is not enough, or when tank fed. They can also be used in water transfer and irrigation applications. Fire Booster Pump sets are available in diesel and electric drive configurations, assembled on a common fabricated base with pipework manifolds, valves, controls and accessories to provide a fully automated system complying with Compliance code. Systems are engineered and fabricated in strict adherence to the relevant fire codes. Support services are provided from initial engineering assistance through to on-site commission and after sales service. Recessed Sprinkler : A sprinkler in which all or part of body , other than the shank thread , is mounted within a recessed housing.